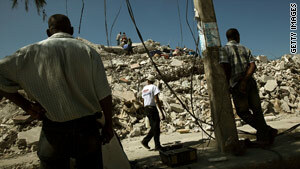 Homes and buildings remain in ruins after a 7.0 earthquake hit Haiti on January 12. Port-au-Prince, Haiti (CNN) -- In patches across the Haitian capital, many earthquake survivors are not waiting for an international clearing and rebuilding effort to begin. They are pulling out shovels, wood and cement to slowly repair and rebuild themselves. "This is what we have to do now," Jean-Fritznel St. Claire said as he hammered away at huge, fallen slabs of a Digicel office building, breaking them into chunks to be shoveled into a truck and taken away. Digicel is a telecommunications company. St. Claire and three friends working with him at Digicel expected the company to pay them for their hard labor, but the group insists that they and others who stayed in the earthquake zone are eager to start clearing rubble and building what they can. "The people who left [Port-au-Prince] have no hope," he said, his face dripping with sweat. "We have hope. So we're here." Elsewhere in Port-au-Prince, businesses and families repaired cinderblock walls and pounded new beams into fractured roofs. One work crew near the airport replaced several broken sewer pipes that were part of a system set up for their neighborhood. But this individual rebuilding alarms teams of engineers studying the damage in Haiti after the 7.0-magnitude earthquake January 12. "It worries me," said Reginald Desroches, a Haitian-American engineer from Georgia Tech who is part of a volunteer assessment team working with the United Nations' mission in Haiti. Desroches and his crew say many Haitians are using broken pieces of buildings as construction material, including the metal rebar, or reinforcement bars, that critically strengthen concrete but now lie twisted and bent in the rubble. That makes the bars weak and potentially unsafe. But Haitians are turning to what's available -- even though the materials might be deemed unsafe -- to rebuild structures that ultimately may be declared unsound. "This is a problem," fellow engineer Jean-Philippe Simon said. "These things can just collapse all over again." Indeed, the Digicel building where St. Claire is working contains massive cracks, is missing a two-story wall and leans over the area he's cleaning up. Asked if he's worried that the place could collapse, undermining his backbreaking work, St. Claire responds, "We can't control that. That is up to God."